Looking for a few stocks that can held for 10 years or more? Our team of contributors thinks that you should consider Red Hat, Enbridge, and Bladex. We at The Motley Fool believe that the easiest way to become wealthy is to buy high-quality companies and own them for extended periods of time. With that in mind, we asked our contributors to pick a stock that they think is an excellent buy-and-hold candidate. They chose Red Hat (NYSE:RHT), Enbridge (NYSE:ENB), and Bladex (NYSE:BLX). Read on to find out why. Anders Bylund (Red Hat): I could name a ton of tickers that seem likely to hang around for the next decade, but with limited growth opportunities along the way. It's just as easy to come up with a list of rocket-powered growth stories that would make you rich -- if they survive for another 10 years. Red Hat strikes a unique balance between these extremes. With the caveat that there's no such thing as a foregone conclusion, especially on long timescales, this is the closest thing to a safe bet with an exciting growth runway ahead of it. The company works in the field of enterprise-grade software. Best known for its eponymous Linux distribution, Red Hat also manages popular packages such as the JBoss middleware suite, a variety of virtualization and storage management tools, and a Red Hat-branded version of the OpenStack cloud computing platform. Red Hat's product portfolio is backed by a generous R&D budget as well as a large and active global development community. Published under transparent open-source licenses, the company's core products have the benefit of bug-killing and security-boosting transparency. Open-source software has been disrupting traditional enterprise computing markets for the last two decades, with Red Hat in a lasting leadership role. This approach is winning over the largest names from the traditional proprietary software camp. We're looking at a total market that could reach $500 billion in sales just five years down the road, according to a recent report from market research firm Research and Markets. RHT Revenue (TTM) data by YCharts. Put all of this together and you get a fantastic long-term growth story and we are only in its early days right now. 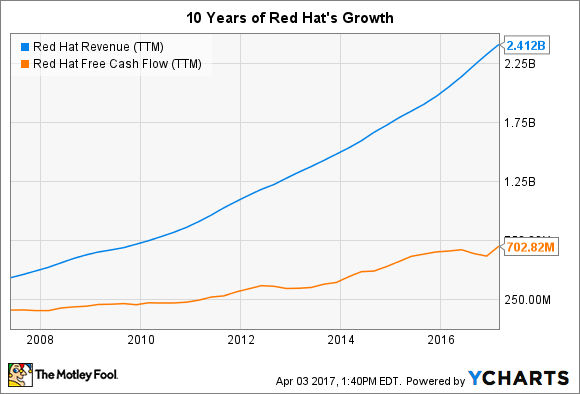 Red Hat has a lot of growing to do over the next 10 years, hopefully taking us shareholders along for the ride. Matt DiLallo (Enbridge): Canadian energy infrastructure giant Enbridge has the largest commercially secured backlog in the sector. In the near term, the company has 27 billion Canadian dollars of projects under construction ($20 billion), which should enter service through 2019. These primarily fee-based projects should fuel 12% to 14% compound annual growth in available cash flow per share through 2019. In addition, Enbridge has another CA$48 billion ($35.7 billion) of longer-term projects under development. These projects include not just its bread-and-butter oil and gas pipeline expansion projects but also several renewable power projects, including a boatload of offshore wind projects. This pipeline of growth projects gives Enbridge the clear visibility that it can achieve 10% to 12% annual dividend growth through 2024. Enbridge also isn't likely to stop growing. That's because it has several other expansion options that should extend growth further into the future. For example, the company is currently investing CA$1.7 billion in financing half the cost of building a 497 MW offshore wind project in Germany, which has the embedded option to expand by another 112 MW in the future. That's just one of several potential expansion opportunities as Enbridge looks to extend and diversify its growth, making it an ideal stock to buy and hold for the next decade. Brian Feroldi (Bladex): Latin America is a resource-rich area that promises a lot of long-term growth. However, investing in the region can be tricky since it is sensitive to commodity price swings. The recent downturn in energy prices has contributed to the political and economic upheaval that we have seen in countries like Brazil, Venezuela, and Colombia. So how can investors safely put money to work in this part of the world? One of my favorite answers to that question is Banco Latinoamericano de Comercio Exterior, or simply Bladex. This company is a merchant bank based in Panama that was set up years ago by central banks to help facilitate Latin American trade growth. Unlike traditional banks, Bladex doesn't offer banking services to retail customers. Instead, the company provides letters of credit, financing, and other short-term banking solutions to local importers and exporters. What I like about this business is that the company can be nimble and pare back exposure to any country that may be in trouble. As an example, Bladex recently pulled back on its exposure to Brazil because of the ongoing recession and political trouble. This flexibility has proven to be a huge advantage for investors as it allows the company to post steady results even during times of crisis. 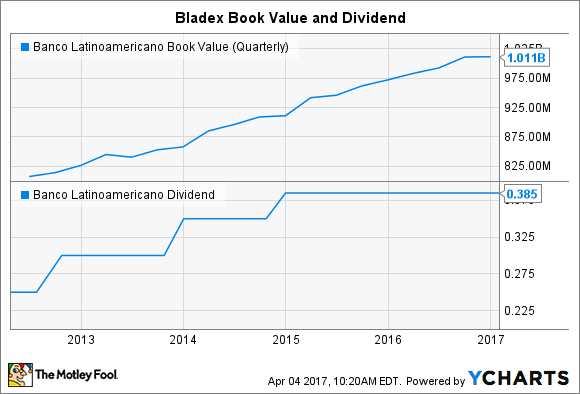 As you can see, Bladex's book value has steadily risen over the last five years. Meanwhile, the company's dividend also continues to grow, although the payout has held flat even since commodity prices took a nose dive. Looking ahead, I think that Bladex is well positioned to post slow and steady growth as energy prices recover and stability returns. Add in a growing dividend that currently yields 5.5% and perhaps you'll understand why this is one stock that I plan on hanging on to for decades to come.